Wall Street’s trade war jitters have resurfaced, and the Dow is bearing the brunt of investors’ worries. US stocks retreated on Wednesday after the White House moved ahead with plans to launch tariffs on another $200 billion worth of Chinese goods. Investors fear that President Donald Trump’s crackdown on trade will derail the zooming global economy by denting business confidence, jacking up prices and paralyzing supply chains. “It’s clear the situation is escalating. At this stage of the game, you have to be concerned,” said Jeff Mills, co-chief investment strategist at PNC Financial Services Group. The stock market is hardly freaking out — all three major indexes are still up sharply in July. However, concerns about a trade war have caused the Dow to seriously trail its rivals. The blue-chip index, home to companies that rely on international trade to make money, dropped nearly 200 points on Wednesday. The biggest losers included Caterpillar, Boeing and Intel (INTC) — all of which do significant business in China. Wednesday’s dip knocked the Dow back to breakeven for the year. That’s a dramatic departure from the Nasdaq, where highflying tech stocks have lifted the index 12% in 2018. Netflix (NFLX) has more than doubled this year, while Amazon (AMZN) has soared 50% . Even the broad S&P 500 is still up by a healthy 4%. Investors have decided to camp out in tiny American stocks. The small-cap Russell 2000 has raced 10% higher in 2018. It’s a bet that domestic companies will avoid the brunt of a global trade war. It makes sense that the Dow has been left in the dust. A trade war would inflict the most financial pain on multinational and industrial companies. In many ways, the Dow is the epicenter of global trade. Boeing (BA), the highest-price stock in the Dow, makes more than half of its revenue outside the United States. That’s a big deal because the Dow assigns a greater weighting to members with higher prices. Caterpillar (CAT), another pricey Dow member, gets one-fifth of its revenue from Asia. “Those two companies are the poster children around trade,” said Mark Luschini, chief investment strategist at Janney Capital. Now that General Electric (GE) has been kicked out of the Dow, the index’s biggest loser is 3M. The Post-It maker relied on Asia for 31% of its sales last year. That’s nearly as much as 3M (MMM) made in the United States. It’s not just the Dow reflecting trade jitters. Over in the commodities market, copper, which is highly sensitive to economic growth, plunged 3.6% on Wednesday to the lowest level in a nearly year. Soybeans fell to a 10-year low after China included them in its list of retaliatory tariffs. The trade battle between Washington and Beijing has heated up in recent days. On Friday, Trump officially imposed tariffs on $34 billion on Chinese goods. 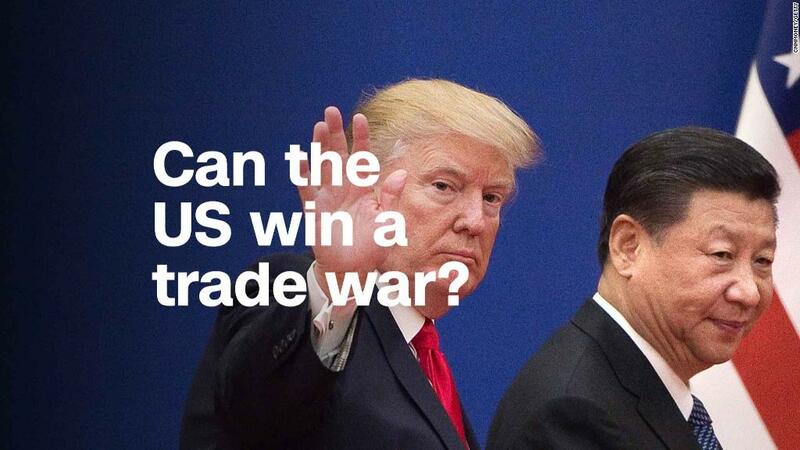 China quickly retaliated — and accused the US president of starting the “biggest trade war” in history. Late Tuesday, the Trump administration forged ahead with a threat to impose tariffs on another $200 billion of Chinese goods. Trade officials released a list of thousands of additional products that could face a 10% tariff. This third wave of tariffs would go into effect after August 30. Hopes for a quick resolution on trade have faded. Now, Wall Street is on high alert for tariff-related warnings from CEOs during the upcoming earnings season. Harley-Davidson (HOG) recently said that tariffs could cost the motorcycle maker $100 million. Similar disclosures could cast a shadow over what is otherwise strong profit growth from Corporate America. “The mounting trade uncertainty has the potential to cause CEOs to delay investment decisions. The big risk is a deterioration of confidence,” said PNC’s Mills.